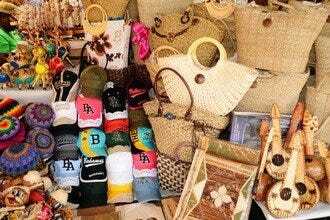 Shoppers will find an assortment of handmade items on Grand Bahama Island, from braided jewelery, painted conch shells, and straw hats and baskets that serve as the "signature" souvenir to bring home. Most of the shopping action can be found in the Port Lucaya Marketplace, a collection of stores, restaurants, and bars that also boasts the Straw Market in the back where prices are negotiable. Within the marketplace, there are a few stand-out shops like Leo's Art Gallery, which showcases the works of the talented artist, Leo Brown. At the cruise port, the Freeport Harbour has a collection of shops in the straw market, as well as restaurants and entertainment. Although not as large as the Port Lucaya Marketplace, shoppers can pick up some unique items before getting back on the cruise ship. In addition, several art galleries and specialty shops can be found throughout the island, like the Perfume Factory, located next to the International Bazaar, and offers tours of the shop as well as unique fragrances and lotions. 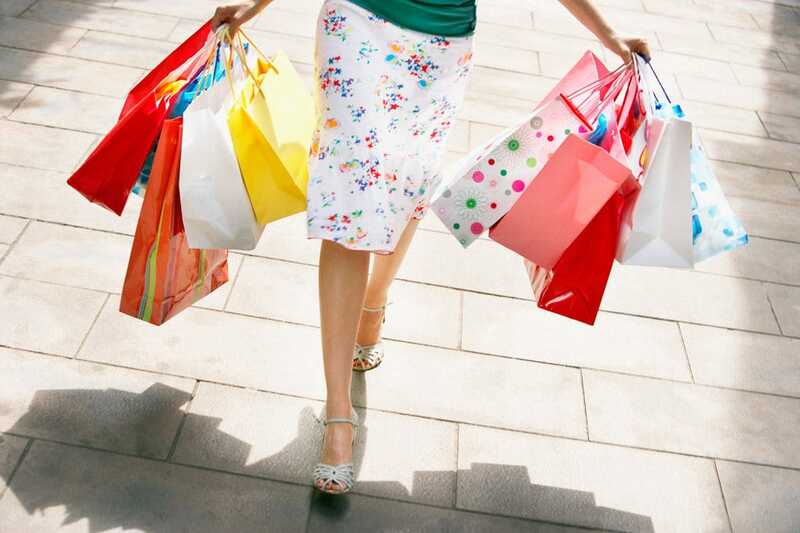 To help make shopping easier, the experts at 10Best.com have put together a list of popular souvenir shops, marketplaces, and specialty stores to find that special something to take back from vacation. Unfortunately, in the last six years or so the International Bazaar has fallen on tough times - to say the least. Following a hurricane and the closure of a neighboring hotel, most shops are now shut down. It's a bit depressing to walk through the alleys past what was once a global marketplace, but on the right side there are a scattering of shops in the Straw Market and - due to the lack of business - you can certainly find a good bargain. The Perfume Factory is located here and is still open for tours and business and worth a visit. If you go late enough, you can also grab some drinks at the Gully Wash Nest - a local bar only open in the evenings. 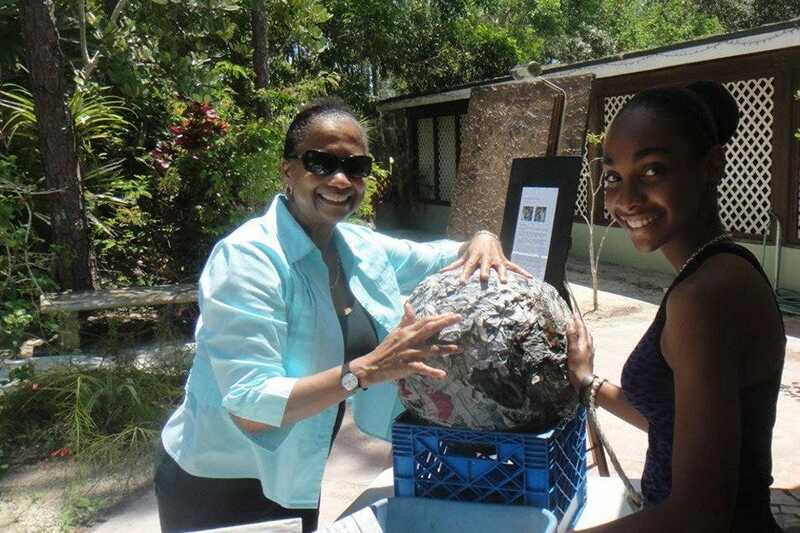 The Grand Bahama Artists Association has about 30 members who each contribute their own distinct style. Artists produce wooden sculptures; paintings made with oil, acrylic, pencil, and watercolor; as well as sequined tapestries and hand-made paper collages. Many showcase island life, and all of the pieces are original works of art which can be viewed in the Glory Banks Gallery at the Rand Memorial Nature Centre. Many are available for purchase. The group also creates a number of events on the island, so be sure to check with them before your visit to see if there is anything going on! The Port Lucaya Straw Market is located at one end of the Port Lucaya Marketplace complex behind the stores, restaurants, and bars. Here you can find vendors selling handmade goods, t-shirts, beach towels, and various souvenirs like magnets, straw creations, hats, key chains, handmade jewelery, ash trays, and just about anything with "Bahamas" stamped on it. While many items are "made in China" there is a nice assortment of authentic Bahamaian creations as well. All of the merchants are open during the day, but some close earlier than others. Don't miss the wood carving stand - the pieces are stunning! One of the best places on the island for European-style women's clothing, this chic boutique has clothes for both casual and dressy "date night out" occasions. The shop is fairly small, but the garments are classy, and feature many high-end brand names. The staff is friendly and helpful. Designed for active, energetic women, the selection also includes handmade Bahamian jewelry, handbags, swimwear, and sunglasses - a great and useful reminder of the island! An institution for more than 10 years, Bandolera is conveniently located in the Port Lucaya Marketplace - right near a number of pubs and restaurants for a break from shopping. This colorful, cute-as-a-button stand is located in front of the Straw Market at the Port Lucaya Marketplace. Granny's House sells authentic, hand made straw baskets and Bahamian novelty hats at reasonable prices that make great souvenirs! Bright colors are woven together to create funny animal designs that the kids are sure to love. They are also a sponsor of the Cancer Society. Just steps away from this quaint little shop is Zorba's Greek restaurant, scooter rentals, and Count Basie Square for musical entertainment. Beaches are across the street (behind the hotels). Just remember, everything in Port Lucaya Marketplace is duty free! This is local artist Leo Brown's gallery where he showcases his Haitian-style paintings. Each piece has an interesting story of its own to tell. 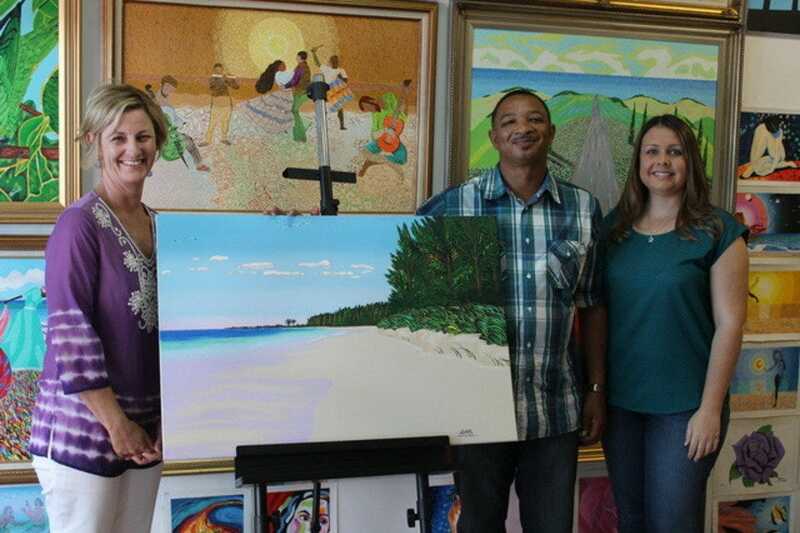 Much of his work depicts life on the islands, for an authentic reminder of what Grand Bahama is like outside of the tourist area. His studio is also here, so the small space is cozy. Depending on your tastes, most pieces are very affordable – the perfect place to pick up a nice memento of your trip! It is located at Port Lucaya Marketplace and open seven days a week. You can find it near Zorba's Greek Cuisine. Opened in 2010, as the island's only purveyor of gourmet and specialty foods, this shop has items that are imported from over 35 countries. Find such delicacies as European chocolates and cheeses, South American coffees and fine Asian teas. If they don't have it, they will find it for you. There is also a liquor store for those seeking Bahamaian rums, beers, or other spirits from around the globe. Gourmet coffee, fresh squeezed juice, cakes, and pastries are served at the cafe, and fresh produce, frozen foods, and other typical grocery items can be found throughout the store. There is even a jewelery outlet. 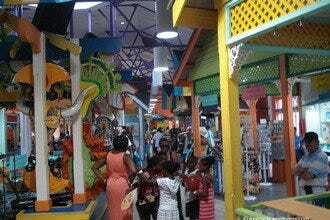 Cruise ship passengers' first introduction to Grand Bahama Island is the Freeport Harbor, a collection of shops and restaurants in the cruise port. While not as large as the Port Lucaya Marketplace, there are several handicraft, souvenir, and clothing stands to choose from for a last-minute purchase before boarding the ship. Due to the location (away from Lucaya and the hotels), this is one most travelers won't seek out unless taking a cruise. Several restaurants including Senior Frogs, and occasional live music provide additional entertainment. 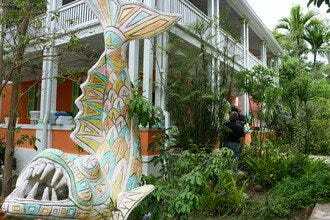 Spread over six acres, Port Lucaya Marketplace is one of the most popular places on the island. Conveniently located on Seahorse Road, this is a paradise for food lovers and shopping addicts alike. Count Basie Square is located behind the Marketplace, as is the 50-slip marina. Additionally, you will find a large straw market here along with dozens of other shops and boutiques. The best jewelry and perfume stores can also be found here. The market is a fun place to while away some time during the day or evening, and Lucaya Beach is located behind the hotels, directly across from the market.